Back in December, I tasted the rare and expensive A.H. Hirsch 16-Year-Old Bourbon. While writing about that stellar spirit, I noted that A.H. Hirsh is the last of the bourbons made at Michter’s Distillery in Schaefferstown, Pennsylvania. Today, a series of whiskeys are made under the Michter’s name, but none of them come from the original Pennsylvania distillery. This Stogie Spirit article is of one of those post-Schaefferstown Michter’s whiskeys. It’s called Michter’s US 1 Single Barrel Straight Rye, which is made by an undisclosed Kentucky distillery. As the name suggests, this is a single barrel straight rye, meaning it’s made with at least 51 percent rye mash (usually mixed with corn or barley) and aged in new charred oak barrels. Each clear bottle is individually numbered (my sample came from 8D-41). All rye must be 160 proof or less and, like most, Michter’s comes in well below that at 91.4 proof. The color is an impressive shiny copper hue. After pouring myself a few fingers, I notice an aroma of resin, vanilla, and citrus. The taste consists of oak, pepper, and cedar that warms the corners of your mouth. The finish is long and smooth with a hint of mint. This is a favorite rye of mine and, at a cost of $35 per bottle, it isn’t going to break the bank. In fact, that makes it about a quarter of the price of the Hirsh and nearly half of what Michter’s ultra-premium 10-Year Single Barrel Rye costs. The reasonable price also makes it a great candidate for a classic Manhattan. 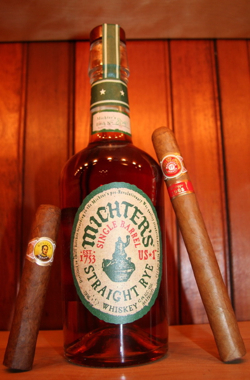 As for cigar pairings, I’d pick a cigar with a little spice of it’s own to stand up to Michter’s classic peppery flavors. The CAO LX2, Don Pepin Blue Label, or even the Opus X seem well-suited for the task. It's great that rye whiskey is finally making a come-back. Too long has this classic American whiskey been buried under the popularity of its Southern cousin. Amen. I'd like to try this one, being a Pa. boy. But I think I'll stick w/ my Old Overholt at about $15 a bottle. Did someone say Manhattan? They go well with any cigar. You know, I've never given rye much of a chance, but I wonder what kind of cigars go well with cachaça. Been drinking a lot of that lately. I love the Michters US # 1 but can't find it here in the Boston area. Where can I buy it?